this can only happen cos of convent girl and clueless boy: he is happy to give her permission to like him, and she is happy to be his fan. Shin Woo concoots their "love story" out of the truth of past events. but instead of calling him "hyung" she has to practise calling him "oppa"
the question: first kiss. when? today. Tae Kyung ponders over fan loyalty and warns pig rabbit not to be fickle. then he finds out Mi Nam just joined the fan club! after all, the nickname she uses is pig rabbit. duh! Tae Kyung tests her out with a series of questions. 6) how much do you like Tae Kyung? 100! she is rewarded with fan-meeting! jang guen suk sings "fly me to the moon" in english! and park shin hye accompanies him! He Yi complain she never had a meal with Tae Kyung before, so she decided to change things. then Mi Nam turns up and He Yi was saved. Jeremy became the scapegoat. After that, the boys made proper fried rice for everyone. during the meal, He Yi noticed Shin Woo's attention over Mi Nam and followed him out to his car and saw his presents for Mi Nam. when the opportunity came, she forced Mi Nam to wear the shoes and carry the flowers in. Shin Woo saw and stunned speechless. He Yi wants Shin Woo to say who he bought the presents for, but he couldnt. He could only ask Mi Nam to throw the presents away. This was the last straw for Tae Kyung so he called it quits with He Yi. cos if He Yi exposes it, she wont be able to clear her part in it either. 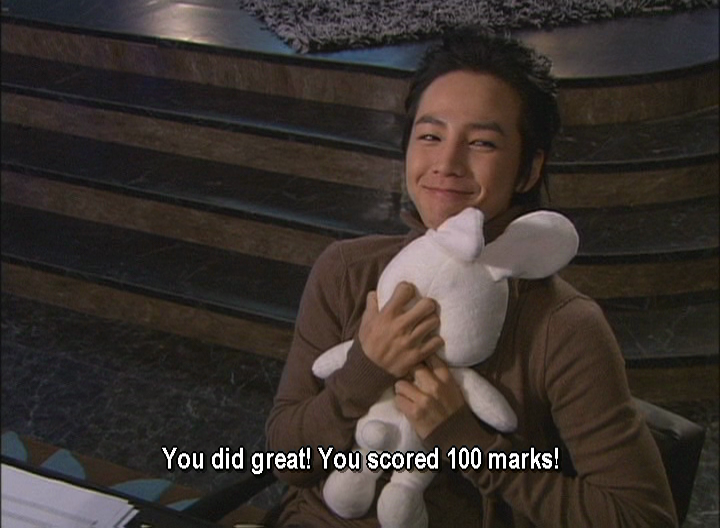 Shin Woo was the sad one, but he ends up comforting Mi Nam! 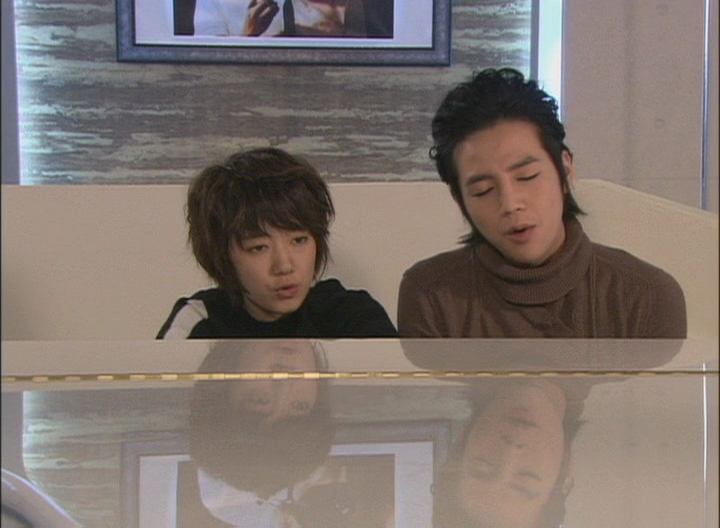 Tae Kyung has to redo the song and hates it, so he wants Mi Nam to keep him company. but Mi Nam needs to go Busan with Shin Woo today, to meet his parents! Manager Ma, Miss Wang and Jeremy are going too. They will only be back the following day, cos they are going to eat sea eel, and sightsee. Tae Kyung tries to bribe Mi Nam with sea eel in Seoul. Manager Ma and Jeremy had another appointment, so it ended up just the 2 of them going to Busan. Another 'idea' from the manager. 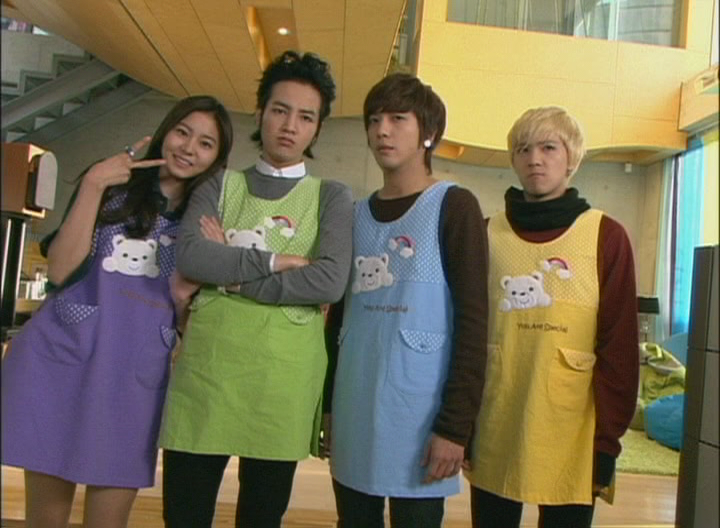 Shin Woo has to go first, then Mi Nam change into girls clothes and join him. Shin Woo asks if Mi Nam wants to convert their false relationship to real, since the ones they love cant love them back. Mi Nam has no response. Shin Woo has started to like Mi Nam. If she can start to like him back, to join him on the plane. Tae Kyung, in the meanwhile, has gone to the airport to catch his fan, but cannot find her. he is about to drive to Busan when they meet in the carpark. he hugs her. and gives her a score of 100. i guess that is another step improvement from the man.